Our beautiful and bright Miss New York USA 2009 Tracey Chang just secured an interview with Dr Doom Nouriel Roubini. 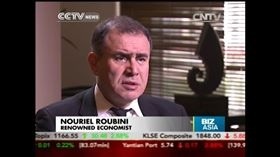 Note: Dr Doon Nouriel Roubini is an American economist. He anticipated the collapse of the United States housing market and the worldwide recession which started in 2008. Tracey Chang joined CCTV News in 2013. She is an anchor and reporter of CCTV’s flagship business news program Global Business – Asia. Tracey has conducted numerous in-depth interviews with leading global CEOs and business leaders. She was also invited to be a moderator for the 2014 summer Davos World Economic Forum. Prior to joining CCTV-News, Tracey was a reporter and correspondent at CNBC Asia, where she was the first on air talent to broadcast in both English and Mandarin Chinese. Tracey also worked as a mergers and acquisitions analyst with Lehman Brothers and Societe Generale in New York City before switching to the field of journalism. While working in New York, Tracey was honored with former New York City Mayor and presidential candidate Rudy Giuliani for their outstanding contributions to the Asian American community, and was given the Asian American Excellence award by former New York State Governor David Paterson. Tracey holds a BA in economics from DePauw University and an MBA with concentrations in financial restructuring and media management from Columbia Business School.